The world’s leading maker of Flash storage solutions and DRAM memory modules, Super Talent has announced the upcoming launch of its new SuperSpeed USB 3.0 RAIDDrive, which the company claims as the world’s first USB 3.0 Flash drive that supports transfer speeds up to 10 times faster than USB 2.0 drives – 200MB/sec, supporting UAS Protocol to reach up to 320MB/sec transfer speeds. The Super Talent’s high-speed USB 3.0 thumb drive that fully backward compatible with USB 2.0 ports will utilize patented ‘multiple pairs of differential serial data lines technology’ aimed for optimal NAND flash performance. 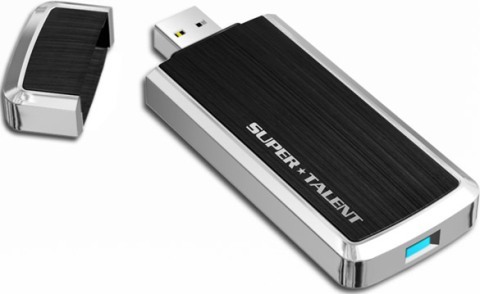 Super Talent’s SuperSpeed USB 3.0 RAIDDrive which measures 95 x 37 x13 mm is expected to be available in coming December 2009 in 3 variants of memory capacities – 32GB, 64GB and 128GB.